This weekend finally brought a break in the thick and persistent fog that has characterized our weather for more than a week. 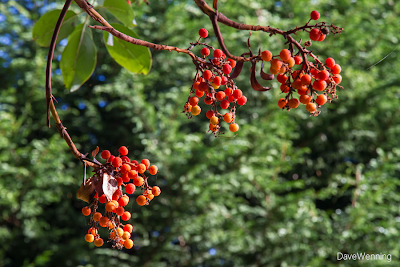 A bit of sunshine today provides the opportunity to photograph the fruit-bearing Pacific Madrona in my yard. The so-called "Strawberry Tree" continues to amaze me. The fruits are arranged in clusters like grapes and are the size of large peas. The surface is slightly rough, similar to orange peal. Right-click the next photo to enlarge it and you'll see what I mean. The color of the fruits is becoming more red as the days pass. I have seen images on the net that show them a deep red color. I am curious to see how far and for how long this will progress on my tree. I received some comments in a previous post about the tree's name. 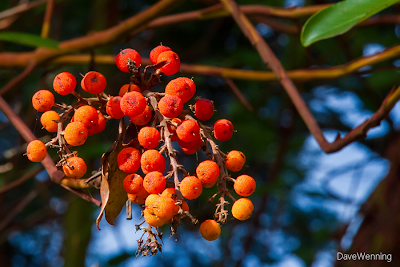 I have read they are called Arbutus in Canada, Madrones in California and Madronas in Washington and Oregon. Apparently it is not that cut and dried. Ivan who lives in Portland and Lance Sjogren who grew up in Portland tell me they call them Madrones. Jill, on the other hand, was raised near Portland, but now lives in Seattle. She calls them Madronas like I do. Canadian authors Jim Pojar and Andy MacKinnon call them Arbutus (the tree's binomial is Arbutus menziesii) and give Madrone as the alternate common name. I grew up in Gig Harbor in the south Puget Sound area and to us they were Madronas. Madrone sounds very strange to my ear. Interestingly, the Blogger spelling checker likes Arbutus, but neither Madrona nor Madrone passes muster. What do you call this wonderful tree and where do you live? I would be interested to hear from more people. 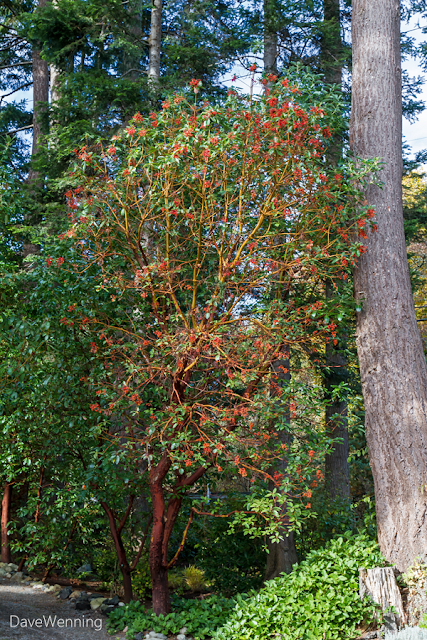 By whatever name, I am sure everyone will agree that the Arbutus/Madrone/Madrona is truly one of Nature's works of art. I am from SW British Columbia and have always called them Arbutus. I only heard the Madronas (and variations) name once I started seeing images posted in various online places from the US. As you likely read in the Pojar and MacKinnon book (which always sits on my desk) Arbutus means "strawberry tree" in Latin while Madrono means "strawberry tree" in Spanish. Hey what a gorgeous tree! Yes, while I grew up east of Portland, my introduction to madronas was by my parents who grew up in Seattle, AND at my grandparent's place on Puget Sound at Brown's Point at the northern edge of Commencement Bay. The locals around there called them madronas, and they were plentiful. I'll have to ask my friends who grew in Seattle area vs. Portland. My friend Matt from Portland calls them madrones. But honestly, there aren't madronas around Portland as far as I know. Don't they live by the sea? It was a Puget Sound thing to me.